JL No Doubles Plugin for Joomla is designed to remove duplicated pages and make redirect links when site structure is changed. Automatically Joomla generates a lot of URLs for the same page. And all of them can be indexed by search engine systems. This can negatively affect site ranking in search results. So we made simple and convenient tool to resolve this problem. This plugin merges duplicated pages and makes redirects to correct page instead of many different pages. Additionally you can use it to fix site navigation after changing site structure (after changing menu alias or moving article to new section). It really helps. 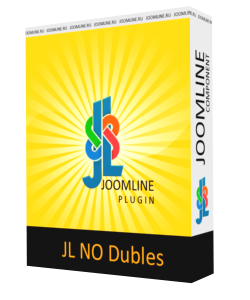 For example, we have reduced by 2 times the number of duplicates on our site with JL No Doubles Plugin. The plugin is based on Shnodoubles, made by Hekima, now supported by Joomline. Attention! The plugin does not work with any third-party SEF components! Joomla SEF must be enabled. The same Joomla page can have several URL addresses. And a lot of other similar pages. It feels really bad when you find in a Google Webmaster 1,000 pages instead of 100 on your website. Because of this, site may be poorly ranked and have a lot of difficulties with the promotion. Our plugin helps to reduce this number to 100. Support for Joomla 2.5 (last version 2.2.0). Ability to configure a 301 redirect to the correct page. Ability to give a 404 error not in contact with the correct page. Ability to specify exceptions to any component installed on site. Support: K2, Virtuemart, ZOO, JoomShopping. (license required). Support category Joomla, correctly processed and various pagination doubles categories, com_tag. Support for exceptions to the words. Useful for all sorts of statistical systems and extensions that do not comply with the rules of the router Joomla. Исправления для нового роутера Joomla. Additional processings if aren't connected libraries. Corrections for a component of tags. Corrections for the disconnected Joomla router. Automatic detection of pagination settings depending on the category of com_content. Corrections for the selected com_content. Added support for categories com_content. Added a system of exceptions do not support a router Joomla. Final release for Joomla 3. Porting functions with Joomla 2.5. Error correction, updating the code in relation to the new requirements of Joomla.